A significant number of airborne particulates was detected within the cartridge after each surgical procedure. Implementation of technologies to supplement air quality engineering controls in the operating rooms (OR) could aid in prevention of surgical site infections (SSI), especially those involving an implant which require a very small inoculum to create an infection. Ultraviolet germicidal irradiation (UVGI) systems can be utilized to improve indoor air quality in high risk clinical applications by inactivating microorganisms and filtering out airborne particulates. 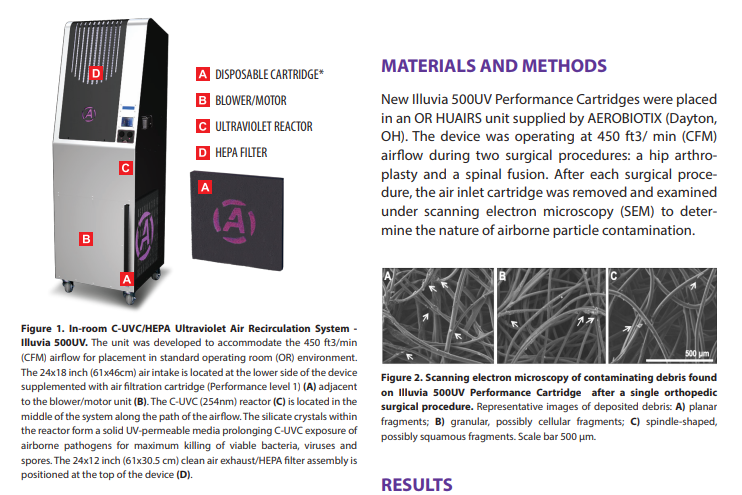 New Illuvia 500UV Performance Cartridges were placed in an OR HUAIRS unit supplied by AEROBIOTIX (Dayton, OH). The device was operating at 450 ft3/ min (CFM) airflow during two surgical procedures: a hip arthroplasty and a spinal fusion. After each surgical procedure, the air inlet cartridge was removed and examined under scanning electron microscopy (SEM) to deter-mine the nature of airborne particle contamination. The SEM analysis of used inlet filtration cartridge showed a significant number of captured airborne particulates. While organisms are slowed or trapped in the solid crystalline matrix, they are inactivated by the penetrating UV-C dosage. This has the effect of immensely increasing the inactivation efficiency over current UVGI technologies.